64 records – page 1 of 2. Photograph of a person sitting in front of the home identified as the Ernest Street family home at 1205 Cumberland Street (old street numbering). Photograph of the Ernest Street home after it was altered. 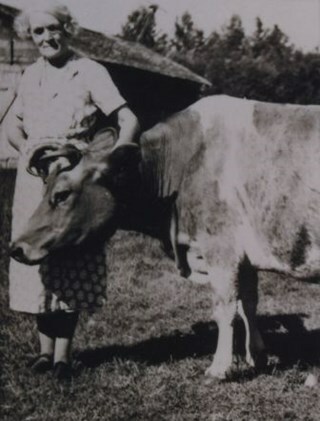 Photograph of Ella Street standing next to a cow - probably at the Street family home on Cumberland Street. 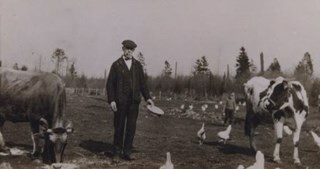 Photograph of Ernest Street and his son Frank feeding the animals at the family farm on Cumberland Street. 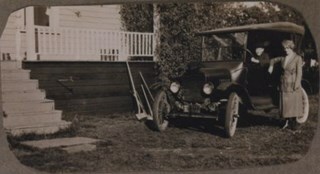 Photograph of Ella Street and her son Frank, posing for the picture with a Model T Ford at the family home on Cumberland Street. Photograph of four men, five young women, a girl and a boy taken outside on a field. A dog ( a sheltie) is lying in the front row and another dog (a poodle) is licking him. This group is identified as; (back row, l to r) Phoebe Love, unidentified young woman in large hat, Sarah Love, Will Parker (later to be married to Sarah Love), Dot Love; (mid row, l to r) Henry Love, George Love, Albert Lewis (neighbor of the Love family); (front row, l to r) Esther Love, Leonard Love, and Girlie (Hannah) Love. Photograph of the George Derby Health Centre which includes the main building, parking lot and grounds. Caption at bottom of photograph reads, "George Derby Health Centre / Burnaby B.C." 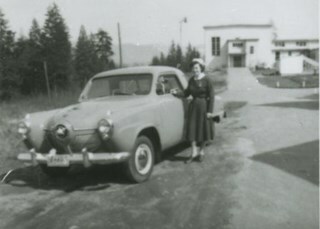 Photograph of Bea Carpenter standing beside a car (a 1950 Studebaker) in front of the George Derby Health Centre. She wearing her nurse's uniform. Photograph of Bea Carpenter in the driveway of the George Derby Health Centre on opening day. 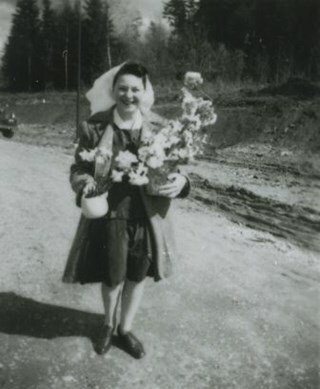 She is in her nurses uniform and carrying flowers. 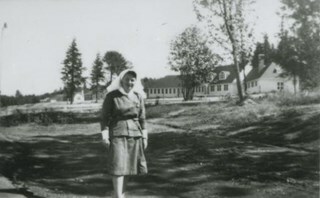 Photograph of Bea Carpenter in her nurses uniform with the George Derby Health Centre in the background. 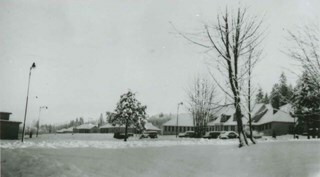 Photograph of the George Derby Health Centre main building and grounds in the snow. 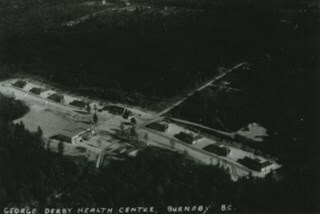 Aerial photograph of the George Derby Health Centre, copied from a postcard. 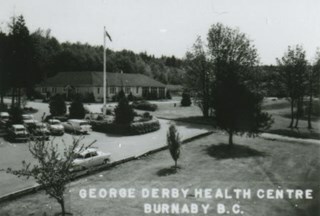 Caption on photograph reads, "George Derby Health Centre, Burnaby B.C." Photograph of two men walking away from the George Derby Hospital. 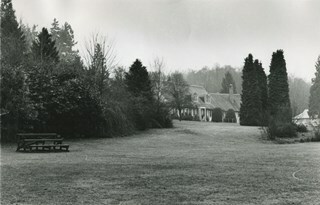 Photograph of the grounds surrounding the George Derby Hospital. 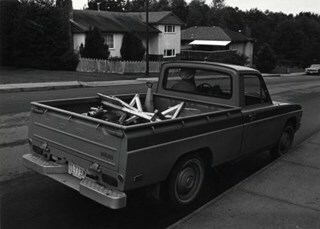 Photograph shows a District of Burnaby Engineering Department truck with the driver inside, parked on Cumberland Street near 17th Avenue. 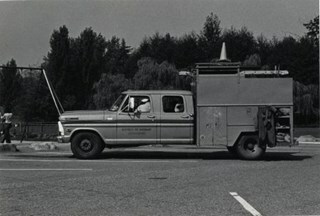 Photograph shows a District of Burnaby Engineering Department truck with the work crew inside, parked in Deer Lake Park at the east end of Deer Lake. Photograph of the administration building at George Derby Hospital. George Derby Health and Occupation Centre was constructed during the years 1946/1947. It was officially opened on April 10, 1947 at 7502 Cumberland Street (later 7550 Cumberland), on the corner of 17th Avenue. Its prime function was a rehabilitation centre for returning World War II veterans. 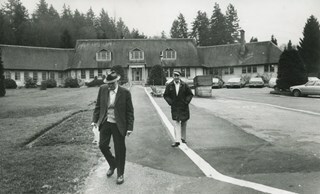 In the fall of 1962 the Centre was amalgamated with Shaughnessy Hospital (Vancouver) and became the George Derby Wing. 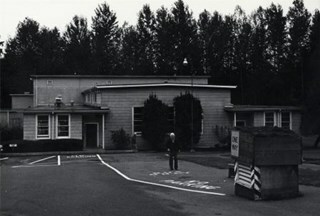 Photograph shows the treatment building at the George Derby Hospital. Photograph shows the arts and crafts building at the George Derby Hospital. 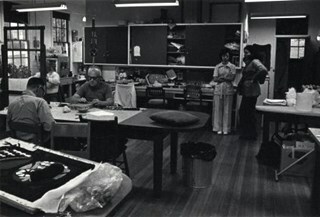 Photograph shows veterans inside the arts and crafts building at the George Derby Hospital. 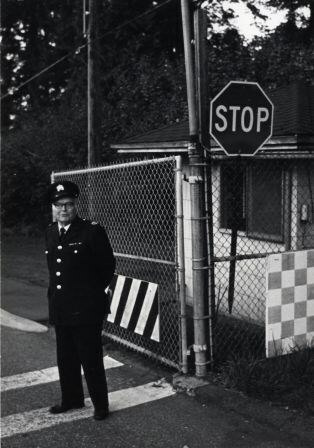 Photograph shows gate attendant at the entrance to the George Derby Hospital. File consists of photocopies and notes of historical information regarding the land ownership of the Jesse Love farmhouse and title of Block 1 and Lots 53 and 54 of District Lot 25. 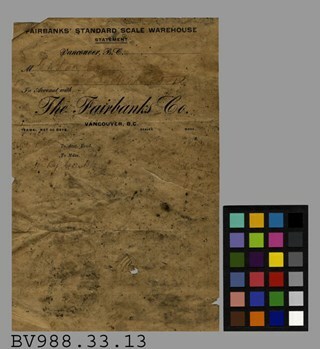 Records include copies from a land title search done through the New Westminster Land Title Office in 1988 which covers ownership between 1928-1988; copy of Corporation of District of Burnaby By-Law 217 (1916) - "To confirm the purchase of and to reconvey a portion of District Lots 25 and 88..." ; copies of pages from Assessment Rolls between 1892 to 1904 ; copy of Land Sale Agreement from J.C Armstrong to Jesse Love, Oct. 6th, 1893; copies of notes from "Charge Book" Feb. 10, 1894 as well as copies of subdivision plans of DL 25. Photograph of the Stanley family. Back, left to right: Esther Stanley and Frank Stanley. Front, left to right: Frank Stanley, Jr., Ina Stanley, and Mary Stanley. Photograph taken from the George Derby Health Centre facing north. 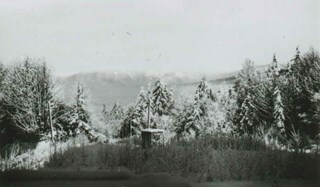 There is snow on the trees, no buildings are visible except for a small shack, and Burnaby Mountain can be seen in the background. Photograph of members of the Love family and friends gathered at a piano in the Love family parlour / music room of the Love family farmhouse. The group is identified from left to right as; Charles Deacon holding a violin, Esther Love holding a flute, Hannah (Girlie) Love (standing behind), Jack Guppy holding a violin, George Love holding a recorder or flute and Dot Love holding a flute. There are framed paintings and photographs hanging on the wallpapered walls behind them. The house was located at 1390 Cumberland Road and Fourteenth Avenue (address after 1960- 7651 Cumberland Street). 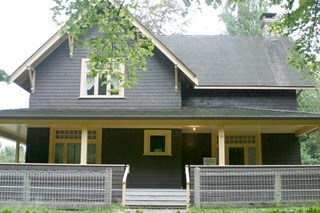 The house was relocated to the Burnaby Village Museum site in 1988 and restored to the 1920s era. The core of the Jessie Love farm house is a 1893 two story, pioneer tent style building. The home was added to over the years and became a large Craftsmen style farm house. Built on Cumberland Road in Burnaby in 1893. Music Room/Parlour/Living Room and bedrooms above added c.1898. Kitchen added c.1908. The home of Jesse and Martha Love and their eleven children. One of Burnaby's oldest structures. 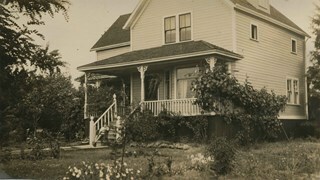 The home was moved to Burnaby Village Museum in the late 1980s and has been partially restored to its 1920s appearance. Shield Brand - Label. Paper label for Shield Brand Dry Sheathing. The label has a red background with a shield with a red cross in the middle of it. Around the sheild is a yellow outline that looks to be fire. 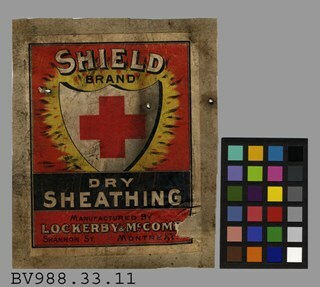 The Shield Brand Dry Sheathing was manufactured by Lockerby & McCorm-- Limited on Shannon Street, Montreal. The label measures 11cm x 14cm. Brackman-Ker Milling Co - Envelope -- [1901?]. Envelope addressed in ink to "Mr. J. Love" in "City". The envelope was sent by Brackman-Ker Milling Company, Manufacturers and Dealers in Flour, Grain, Meals, Etc on Front Street, New Westminster. 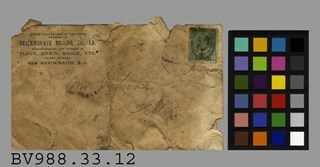 There is a green stamp on the top right corner of King Edward VII and a post mark stamp just below "NEW --/ FE 4/ 01/ B.C.". Handwritten in pencil on the reverse side is "Your Father Wants to see you here, J.L.". The envelope measures 14.5cm x 8.5cm. While Shepherds Watch'd Their Flock - Sheet Music. 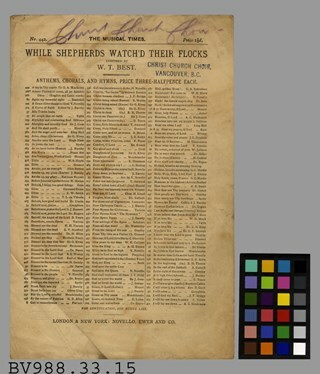 Page of sheet music for "While Shepherds Watch'd Their Flock", with music by W.T. Best and words by Nahum Tate. The music was published by Novello, Ewer and Company in London and New York. On the other side of the music is an index of Anthems, Chorals, and Hymns all priced at Three-Half Pence Each. At the top of the page written in purple pencil is "Christ Church Choir". The music page measures 17.5cm x 27cm. Christianity -- what is it? : five lectures on Dr. Harnack's "wesen des christentums"
Harnack, Adolf von, 1851-1930. Wesen des Christentums. George Routledge And Sons, Ltd.
340 p. ; 20 cm. This series of 26 "Elsie" girls books are said, by the donor, to have been purchased by Jesse Love and his son in law Wallace (Flash) Whiting for the youngest of Jesse and Martha Love's children Hannah Victoria (Girlie) Love, age 10 at the time, and Annie (Love) Whiting's daughter Edith, age 8 at the time. The book series seems to have made their way through some of Jesse Love's daughter's children. Mrs. Whiting. Sarah (Love) Parker, daughter of Jesse Love, even named her daughter Elsie (Parker) Hughes after the main character of the series. The books seem to have made their way through the children and grand children of Annie (Love) and Wallace Whiting. The were donated by Edna Whiting, the daughter in law of Alfred Whiting, one of Annie's sons. 324 p. ; 19 cm. This artifact has been passed down to all the girls in subsequent generations of the family, eventually to the donor, Mrs. Whiting. This series of 26 "Elsie" girls books are said, by the donor, to have been purchased by Jesse Love and his son in law Wallace (Flash) Whiting for the youngest of Jesse and Martha Love's children Hannah Victoria (Girlie) Love, age 10 at the time, and Annie (Love) Whiting's daughter Edith, age 8 at the time. The book series seems to have made their way through some of Jesse Love's daughter's children. Mrs. Whiting. Sarah (Love) Parker, daughter of Jesse Love, even named her daughter Elsie (Parker) Hughes after the main character of the series. The books seem to have made their way through the children and grand children of Annie (Love) and Wallace Whiting. The were donated by Edna Whiting, the daughter in law of Alfred Whiting, one of Annie's sons. 334 p. ; 19 cm. This artifact has been passed down to all the girls in subsequent generations of the family, eventually to the donor, Mrs. Whiting. 334 p. : 19 cm. 279 p. ; 19 cm. 373 p. : 20 cm. 291 p. ; 19 cm. 406 p. ; 20 cm. 317 p. : 19 cm. Jesse Love was born in Swindon, England in 1847 and left England to work on a dairy farm in the Toronto area. While working on the farm in Toronto, he met Martha Leonard who he married in 1879. Martha was born on February 3, 1858 in Bedfordshire, England and had come to Canada with her parents George and Ann Leonard. While living in Toronto, Jesse and Martha had two children, George born March 22, 1880 and Annie Elizabeth on August 24, 1881. About one year after Annie was born, the Love family moved to North Dakota to grow wheat. While living there, they had two more children, Henry who was born August 24, 1883 and Edith Minnie born October 9, 1885. The family decided to move further west after hearing about the fairer weather conditions from Martha’s father, George Leonard, who had settled in Vancouver in 1885. On May 23, 1887, Jesse, Martha and their four children arrived in Vancouver after travelling across Canada from Winnipeg on the first transcontinental train. The Loves made their home in Vancouver while Jesse helped clear land on Granville Street. Their fifth child, Thomas Robert was born on September 17, 1887 and soon after, the family moved to Lulu Island in Richmond where they lived growing vegetables and selling them to Vancouver hotels. While living and farming on Lulu island, the couple had two more girls, Martha (Dot or Dorothy) born on December 17, 1889 and Sarah Marie, born February 8, 1892. On October 6, 1893 an agreement was signed by Jesse Love to purchase 14.52 acres of land from Joseph C. Armstrong. The acreage covered the north east section of District Lot 25 within the newly incorporated District of the Municipality of Burnaby. It was here where the original Love house was built (between October 1893 and April 15, 1894) by Jesse Love with the help of local builder George Salt and father in law, George Leonard. The house consisted of an entrance hall, dining room, lean to kitchen, master bedroom and three bedrooms upstairs. A road was constructed and named Cumberland in 1905 and ran from District Lot 25 through to District Lot 11. The address for the Love home was 1390 Cumberland Road and in the early 1960’s the address was renumbered 7651 Cumberland Street. On the land surrounding the house, Jesse Love planted an orchard along with strawberries and raspberries which he sold at the Fraser Valley Market, T.S. Anandale’s Grocery Store in New Westminster and to hotels around Vancouver. Jesse Love served on the Burnaby School Board and also as a District Councillor in 1901 and from 1904-1907. 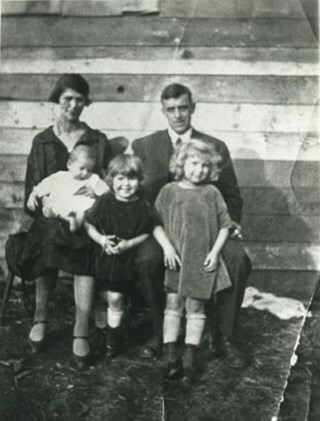 While living in the house, Jesse and Martha had four more children, Phoebe Leonard, born April 15, 1894, Esther, born August 28, 1896, John Leonard, born June 7, 1899 and Hannah Victoria (also known as Girlie) who was born May 12, 1902. As the family grew to eleven children, additions along with some substantial remodelling in the craftsman style took place. In about 1898, a north wing addition was added to include a parlour with two windows, the construction of two more bedrooms and the relocation of the stair case to the North West wall. In 1903 the front door moved to the north elevation, a front porch was extended along the east wall and a summer lean to kitchen was added to the west elevation. Between 1905 and 1910, a tin embossed ceiling was installed along with an addition of the main kitchen which included a pantry, bathtub and a back porch. In about 1912, five craftsman style windows replaced the original pioneer tent style, the front verandah was enlarged to wrap around the south and east elevations, a back door was installed in the kitchen to access the verandah and wood shingle siding and brackets were added to the exterior. In 1918, at the age of 31 years, Robert Love fell ill due to an influenza epidemic and died on November 23, 1918. Following their son’s death, Martha Love became weak and on August 24, 1920, she passed away. By this time, Jesse had sold off a large percentage of his land and his youngest daughter, Girlie decided to stay on to live and care for him. Since the house was too large for just the two of them, Jesse invited any other children to return and share the residence. For a while his son, George and his wife joined them until 1925, followed by his daughter Sarah Parker (nee Love), her husband William and their three children, Albert, Bill and Elsie. The house remained pretty unchanged until 1928 after Jesse Love died of pneumonia (March 10, 1928) and the house was purchased by Sarah and her husband William Parker who continued to live there with their children. The master bedroom wall on the main floor opened up to the dining room, the kitchen pantry and bathtub converted to an alcove with a marble counter and enlarged window and sink while the bathroom was moved to the upstairs and the furnace and coolers were installed in the crawl space under the kitchen. A hot water tank was installed in the house in 1966. Sarah continued to live in the house until a little while after her husband William died in 1961. She sold the house to her daughter Elsie and husband John Hughes in 1966, who lived in the house along with their son Brent, until August 23, 1971. Mahbir Molchan Papan and his wife Geraldine Papan bought the house August 23, 1971 and by 1982, the house was sold to Nirmal Singh Singha and Narinder Singha. The Papans continued to rent the house from Nirmal Singh Singha and Narinder Singha until 1985/1988??. (Box 6- timeline Love House file) In 1988, the house was scheduled for demolition with the remaining property to be subdivided. Fortunately, a neighbour, Mr. Harvey Elder recognized the farmhouse's historical significance and contacted the Burnaby Historical Society. Following this event, the owners agreed to donate the building to the Burnaby Village Museum who financed the move of the house from Cumberland Street to the museum site. Heritage planner and architect, Robert Lemon provided guidance for the project. Prior to the move, the two porches were removed and demolished while the kitchen and roof were both separated from the main house. The kitchen and roof of the house were transported to Burnaby Village Museum on May 20, 1988 by Nickel Bros. House Moving company, while the main frame of the house completed its transportion to the museum near the end of May 1988 (due to low overhead wires). The house was moved down Cumberland Street to 10th Avenue, up Canada Way to Sperling and set on temporary footings near Hart House. Robert Lemon oversaw structural improvements such as, upgrading floor joists and creating new foundations to replace the original timber foundation of the farmhouse. The restoration went through several phases of work between 1988 until it opened in November 1998. Restoration began on both the interior and exterior features to be interpreted from the period of 1925. In 1993, the architecture firm of Brian G. Hart Associates was appointed for the design and construction supervision of the restoration project. Plans were created for a foundation on the museum site in 1989 and the farmhouse was eventually settled on a permanent foundation behind the Burnaby Village Museum administration building in 1993 along with the reattachment of the roof. The kitchen section was reattached to the main house in 1994 along with skirting around the foundation and the reshingling of the exterior. In 1996, the tin ceiling was removed to make way for the installation of the internal electrical system along with sprinklers, ceiling heating and fire break gyproc. The dining room ceiling joists were consolidated, a pantry and bathroom were added to the kitchen, the downstairs bedroom wall was opened and filled, the dining and kitchen doorways were widened. In 1997, a wheelchair ramp was installed along with a concrete sidewalk, stair rails, cement pads at the base of the stairs and a gravel sink for any excess water. Interior work included painting of the kitchen, restoration and furnishing of the kitchen pantry, insulation of the house floor to protect from rodents along with the reconstruction of the kitchen and house chimnies. The registrar worked together with the curator and conservator and was tasked with a large research project on the house including the family contacts and family history, property information, plans, photographs, artifacts, furnishings, stories etc. all organized in files for easy retrieval. A great deal of research and conservation was undertaken in order to make the interior of the house authentic to the time period as possible. One of the biggest projects was selecting and obtaining wall coverings since much of the original wallpaper was incomplete and poor condition.The conservator and registrar were lucky enough to locate a few samples of the original paper and engage the Bradbury and Bradbury Art Wallpaper Company of Benica, California to reproduce replica designs for free. The City of Burnaby now has its own series “Burnaby Village Papers” produced by this company which are titled “Burnaby Wall”; “Burnaby Border” and “Burnaby Ceiling”. All three of these wallpaper designs have been used in the Love farm house and are also commercially available through the Bradbury and Bradbury Art Wallpaper Company. After the completion of the kitchen, the Love farmhouse exhibit opened on November 29, 1998 with an open invitation to the public and extended members of the Love family. Officials including the Mayor, Doug Drummond and Love family members were all present to cut the ribbon for the special event. Photograph of three young women and a man taken outside on a field. The young women are identified as (left to right) Sarah Love, Phoebe Love, and Dot (Martha) Love. The man is William Feedham who was to married Phoebe Love. Photograph of five young women and two young men taken outside on a field. This group is identified as; (back row, l to r) unidentified young man, Sarah Love, Albert Lewis (neighbor of the Love family); (mid row, l to r) Dot (Martha) Love, Phoebe Love, and Esther Love; (front row) Girlie (Hannah) Love. Photograph of Phoebe Love and Will Feedham, who were to be married, sitting on chairs outside on a field. 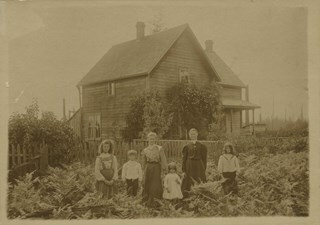 Photograph of the Jesse Love house and family on Cumberland Road. Two women and four children are standing outside of the house. In 1988, this house was moved to the site of the Burnaby Village Museum at Deer Lake Avenue, where it remains today. 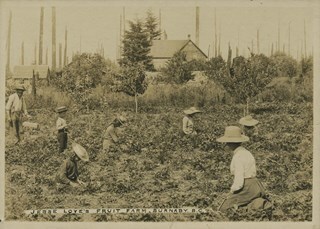 Photograph of members of the Love family kneeling in a strawberry field. Left to right: Jesse Love (father), Leonard, Phoebe, Martha, Minnie, Martha Love (mother), and Sarah. The small building at the extreme left of the picture was George Love's (oldest of the Love's children) first sash and door outlet. He later built Love's Sash and Door Factory on the south side of Edmonds Street just west of 6th Street. 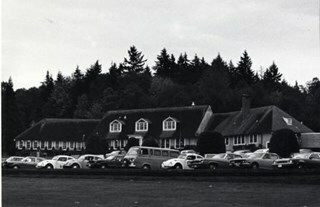 The original farm was located in East Burnaby, on Cumberland Road. 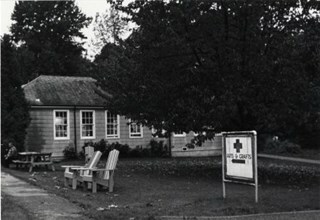 In 1988, this house was moved to the site of the Burnaby Village Museum at Deer Lake Avenue. Annotation bottom of the photograph reads, "Jesse Love's Fruit Farm, Burnaby, BC"
Photograph of the Love family home, 1390 Cumberland Road (later renumbered 7651 Cumberland Street), East Burnaby. The house was built by Jesse Love. In 1988, this house was moved to the site of the Burnaby Village Museum at Deer Lake Avenue, where it remains today. 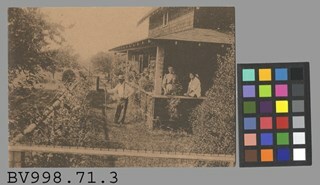 Annotation on bottom of photograph reads, "1390 Cumberland Rd, the old home"